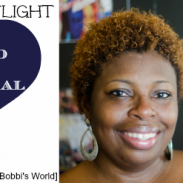 Social Spotlight is back where I get to interview influential and positive people and showcase them here on the blog. I haven’t done one in a while but I want to make sure we highlight some people doing great things while bringing a social change in society. 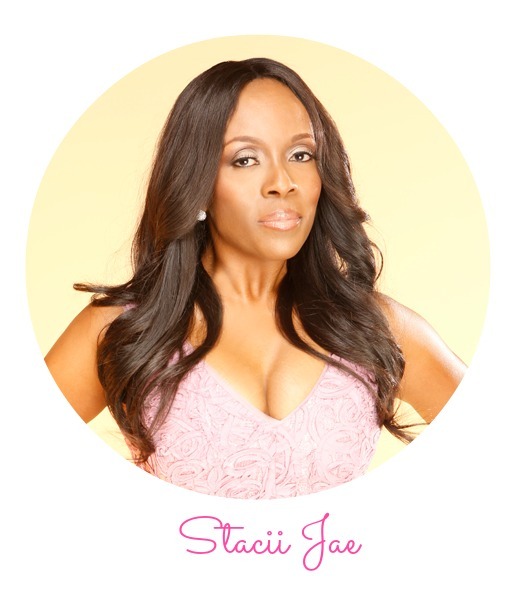 Today I want to highlight Stacii Jae, who has an organization called The Single Girl’s Club and get into depth about the mission and the upcoming conference. 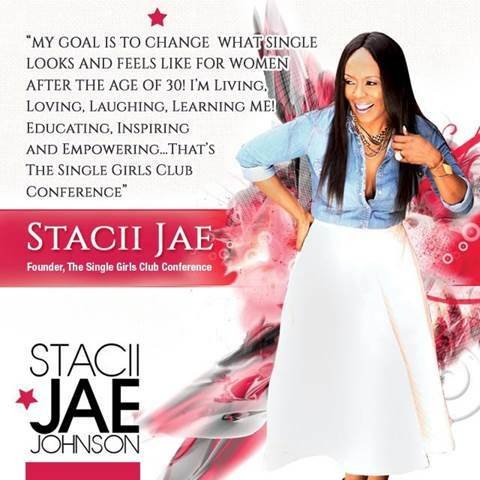 Stacii Jae Johnson is hosting her first-ever Single’s Girl Experience (February 27 – 28, 2015) in Atlanta, GA. Stacii has invited an amazing panel of professional, single women and (some men) to share life changing, educating & empowering tools that not only inspires confidence, but provide insight about why it is important for you to love yourself first. Q: What is the mission of The Single Girls Club? Q: What made you start the concept of The Single Girl’s Club? Stacii: I want to break the norm of the concept of the single woman, remove the negative stigma around women and make it an uplifting movement. Being single can be a positive things and I want to bring groups of women together to celebrate being single in a positive way. I am single and I was once depressed about it, but no longer. Q: Why do you think women are more single than ever before? Stacii: Women are smart. We may date the frog but won’t marry it. Women are researchers and the internet to be honest is making it easier to research things. Women want to date longer. We are not in the era of our mother’s, grandmothers and mother’s before that to where we were expected to get married and pregnant before a certain age and time. We are more career minded and self-sufficient and we are taking care of ourselves. Because of our independence, we can choose to date men longer because they aren’t the only providers in the relationship. Q: Do you think men in this society are also contributing to women being single longer? Stacii: I don’t think women should give men that kind of power. I think it’s more of a trust factor with women with these men. We know the statistic that are out, divorce rates are high and infidelity and I honestly think lots of single women are conscience of that. I just think instead of blaming the men or the statistic, we should take our single status and let it help us push us into our excellence. Q: What about the men complaining about women being too independent and having too high standards? Stacii: The right man will be okay with a woman’s independence. Only a man who wants to control and dominate everything who is immature wouldn’t want an independent woman. The right man would embrace and woman’s independence and respect it. Also, if a woman doesn’t have standard, the man will sure have some and tell you. Men do not have a problem saying exactly what kind of woman they want and what they are looking for, women always feel guilty about this. It’s great to have standards because a man will always have some, and if she doesnt he will mold you into what he wants or find someone who has it. Q: Any information or advice for the single woman feeling desperate and maybe ready to settle for something less than what she is looking for? Stacii: Women shouldn’t settle. If you feel like you are settling you should probably just end it. It’s better to deal with what you don’t like, recognize it and end it now and be happy versus settling for 5-10+ years with negative emotions of sadness, depression, loneliness and resentment. Do not rationalize with a man’s issues, you shouldn’t have to settle or sacrifice your happiness to be in a relationship. The Single Girls Club (TSGC) “Living, Loving, Laughing, Learning ME!” Experience is honoring 50 of Atlanta’s dynamic single females, February 28, 2015 at the beautiful Renaissance Waverly Hotel, 2450 Galleria Parkway, Atlanta, GA 30339 (directly across from Cumberland Mall). The TSGC Experience is projected to have an attendance of 200 single women coming from various parts of Atlanta and the southeast region. The action packed event is centered around creating an unforgettable experience for single girls that is educating, inspiring, empowering and FUN! Special invited speakers includes: WE TV’s Shawn Bullard, BMI’s VP of Writer Relations, Catherine Brewton, Brandi Harvey (Steve Harvey’s Daughter), Lisa Wu (formerly of RHOA) and more. 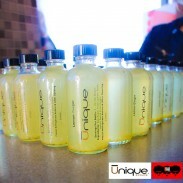 Do You Think Single Women Still Have Negative Stigmas Surrounding Their Relationship Status in These Modern Times? I don’t think single women have negative stigmas surrounding this topic but that’s just one opinion. Thanks for the great review and interview and for sharing. I live sorta near Atlanta and would love to check out the city tour. I have never heard of her before, but she sounds amazing. I love the idea of the single girls club. Actually, I think it depends on who you talk to. I personally don’t think there is a stigma. I’m glad though that I’m not single anymore, and I wouldn’t want to rejoin the single world. What a wonderful movement and a wonderful interview. I definitely felt the pressure of being single before I got married. Our lives aren’t all about finding a husband! I should hope there is not a stigma but there probably is. I got married young and had children young and I know at the time there was a stigma against that. I wish women would embrace whatever their life circumstances are and learn to be themselves. The world would be a much better place! I remember the single life… It was lovely! Sometimes you don’t realize how much you miss and appreciate something until it’s gone but I do enjoy my married/family life too. It is harder to balance though. I think single women should embrace that and enjoy it. Don’t let anyones opinion get in the way. There are far too many people unhappy in relationships anyway. Do what’s right for you. I’ve never heard of the Single Girl’s Club before. I do like the thought of empowering women to be women, whether they marry or not. I’ve never heard of the Single Girl’s Club. I definitely think it’s better to be single than be with the wrong person. I don’t think there’s a stigma. I think today’s woman knows that she doesn’t have to settle, so she’s holding out for the best. Single women are depressed…. What. That is just stupid. I had no idea that almost 45% of women are single! This definitely sounds like something I would want to check out if I were single. I don’t think that is a stigma. Women know what they want and are willing to wait. Wow. I don’t think single women have negative stigma. I didn’t when I was single I loved it and enjoyed my single time. The single life, I remember it fondly. The carefree lifestyle. Despite working a full and part time job, because I had a hunger to succeed I had no one to take care of but me. Of course I love my life now with a family but I am glad I was able to experience the single life and hope my children take the time to as well. Enjoying reading Staci’s answers, and I remember ‘Peaches’! I think the perception of single ladies has changed a great deal – even from when I was just starting out in the dating pool. I don’t see a negative stigma as much. In the past, I used to see some women I knew craving to get married and making insecure decisions based upon those feelings. Lately, I see women dating longer, and not settling. I’ve never heard of Stacii or the Single Girls Club or whatnot. I guess that’s because I don’t watch TV really (or more so we don’t get a lot of US TV here!). It was interesting reading her answers though. I’m not a big fan of being single… haven’t really been single since I was 13, haha. I think there is a stigma. But the event last night sounds great. I would have loved to attend it. I absolutely love this idea! I live in Los Angeles, where it seems like EVERYONE is still single at 30 and it’s no big deal. My husband and I met here in our early 30s, and I actually feel like we were more equipped for a serious relationship at an older age! What a great club to be apart of. This is definitely something I would have attended if I was singe. I have been single almost all my life, and yes it is quite the experience! Being single should never be depressing, or a negative. We need to simply make the best of what we have in the moment. Interesting post. I had never heard of the single girls club before!